$7.950 versus $17,000 - the savings are HUGE! You want full real estate service with an MLS® system listing from a professional salesperson at a lower commission – that's One Percent Realty East Inc. We provide you with full real estate services at a reduced commission rate of $7,950 for homes under $700,000. $3,500 of that $7,950 flat fee goes to the buyer’s sales representative. Houses over $700,000 are 1% of the list price + $950, with the flexibility to offer more commission to the buyer's sales representative, if you choose. We have full cooperation from other real estate sales people who sell approximately 80% of our MLS® system listings. Scenario 1 - Sell through One Percent Realty East Inc. for $7,950 for this same $500,000 home, with all the services and exposure that you would receive from higher commission brokerages. This fee also includes payment to the buyer’s sales representative (usually $3,500). We do open houses, handle the showings, negotiations, and paperwork that you would expect from any full service real estate company. In short, the services and exposure are the same as you would get from option #1 above, but for far less money. The concept behind One Percent Realty East Inc. is that we provide full professional real estate service but a reduced commission. For that full service with an MLS® system listing, we charge $7,950 for homes under $700,000 and for homes over $700,000 we charge 1% plus $950. The '$950' aspect covers the typical disbursement costs to marketing and selling your home. 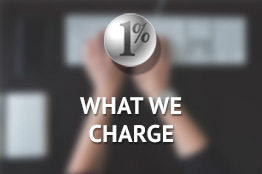 Our agents provide all of the same services as if they would if they were to charge you a higher commission, the only difference being the amount of commission they charge you. Your 1% agent will help you determine the appropriate listing price, list your home on the local real estate board MLS® system and thus your listing will be on the popular realtor.ca where all the buyers look, enter the listing on the onepercentrealty.com website, take interior and exterior digital photos, place a house for sale sign (if applicable), advertise your property where the Buyers are looking, show your home to prospective Buyers, provide you advice and assistance along the way. Our goal, like yours, is to sell your home. The simple answer is yes. Our MLS® system listings are shown, and sold by cooperating REALTORS® all of the time. 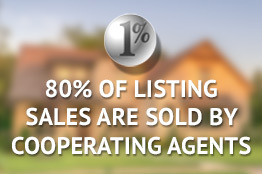 Approximately 80% of our listings were sold by Cooperating REALTORS® representing a Buyer. That is proof that our system works! Why is that? We believe it is for two reasons. Firstly, our listings (under $700,000) typically offer $3,500 commission to Cooperating Brokerages. While $3,500 might not be as much as some other listings, it still is a decent pay cheque for Canadians these days, including many sales professionals. The more important reason other agents cooperate and sell our listings, is because it is the Buyers who are calling the shots these days. As mentioned above, if the Buyer loves the home, the amount of commission being offered will not affect their decision. If you still want to offer more commission to the Buyer’s agent on MLS® system listings than the $3500 or 0.5% for homes over $700,000 – the choice is yours. We would still only charge you the same low fee for our portion of the commission, and you could offer a Buyer’s representative a higher commission of your choice. 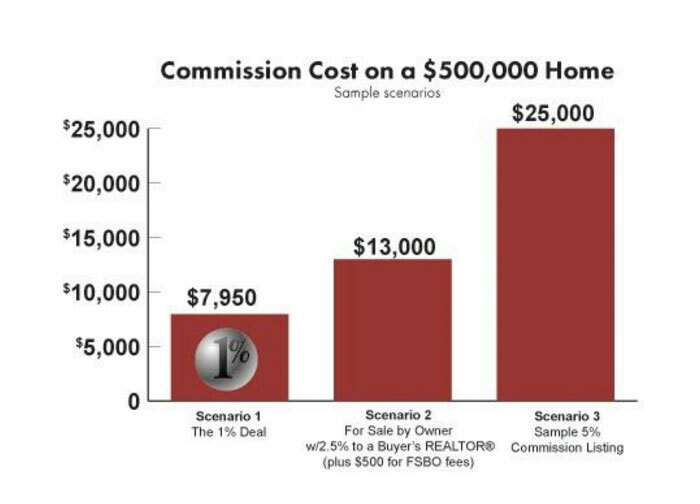 Since we don’t believe offering additional commission is necessary, if One Percent Realty East Inc. sells your home without an outside Buyer representative, we will only charge you our flat fee of $7950 for homes under $700,000 (or 1% + $950 for homes over $700,000).